Collecting Antique Georgian Glass offers rare opportunities to the antique glass collector, buyer or seller. The Georgian period spanned the years 1714 to 1830 and included the regency period of 1811 to 1820. In the Georgian period the first four Georges reigned as Kings of England. Collecting Georgian glass is very popular and can be very lucrative. 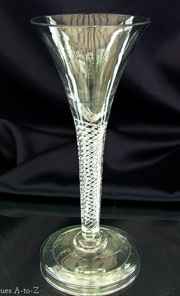 During the Georgian period the English became famous for the excellence of their lead glass. This specific type of glass was either invented by George Ravenscroft in the late 17th century or by him and an Italian glass worker, Seignior Da Costa. In 1673 Ravenscroft set up a partnership with da Costa, intending to produce a new glass in a glass factory at Savoy, London. 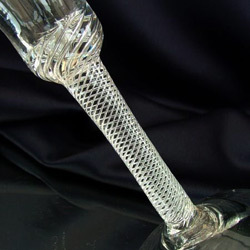 The introduction of this Georgian lead glass almost entirely replaced Venetian soda glass which had dominated the European market for centuries. 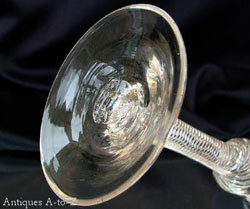 It produced exquisite Georgian drinking glasses, which were normally made in three different pieces – the base, the stem and the bowl. A functional hierarchy existed amongst the workers that produced those Georgian Glasses. While the top job belonged to the gaffer who shaped the bowl and then joined the individual pieces together. Today these marks can help prove the authenticity of a piece of Georgian glass. The most significant mark is the pontil mark which is the glass scar normally found on the base. The pontil mark was created when the glass was broken free of the blowpipe. In addition vertical lines running down the bowl and striations in or around the bowl are among the other identifying features. And collectors should check carefully to make sure the foot has not been ground down or interfered with in any other way. Grinding down the foot rim is a common method of removing and disguising a chipped foot. Collecting Georgian Glass … If you’re looking to add to your glass collection, why not flick through our information on collecting other antique glass types.